What is the most important part of brewing beer? Is it the choice of hops or malts? Is it sticking to the Reinheitsgebot (German Purity Law of 1516)? Perhaps using the right equipment? Or maybe coming up with silly, ironic, or clever names for your beer? While a few of these might help, it’s really about the water. The amount of water in a beer hovers around 90+/-% of the ingredients of a beer. With the many things going in and out of our water these days, it’s important as a brewer to know what is in your water, how much of what is in that water, and what can hurt the taste and/or quality of the final result. Arguably, the larger macro breweries understand this more than anyone. They brew their beer in a couple of different places, all with different types of water. In order to make the most consistent taste, they must not only modify their recipes but they must take the local water and break it down to remove all impurities, and then “rebuild” that with their recipe. This is where craft breweries differ, as that process is not cheap and it is a lot of the reason why these breweries use cheaper / alternate ingredients, to save their bottom line. It goes without saying that this makes for a beer with a lesser taste and product satisfaction. 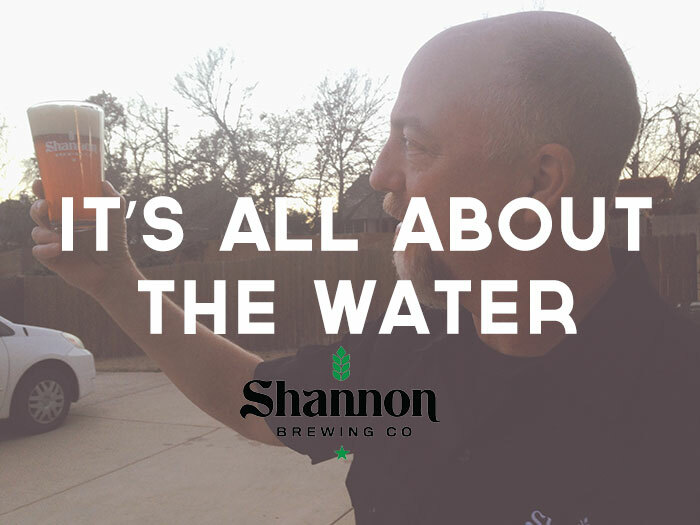 But if you talk to Shannon Carter of Shannon Brewing, a brand new brewery opening in Keller, Texas later this year, he will tell you he doesn’t have to worry about his water. At least, perhaps not as much as other local breweries. In fact, he’s excited to talk about the water in his beer. You see, his brewery (currently under construction) has a special pipe coming from a local spring called “Samantha Springs.” His brewery is actually on top of the spring (which is mostly underground) and with the spring not to far from the brewery, he will be able to use the water directly from the source. Many craft breweries that have opened in North Texas over the past several years are home brewers turned micro brewers. Carter does have a very nice home brew system at home that he works on his recipes with, but he has gained a lot of his knowledge shadowing and brewing with a brewer at a contract brewing company. With nearly 5 years brewing both original recipes and other breweries recipes, Shannon feels he has a lot to bring to the table as a brewer. Carter told us that he really feels that it has given him the opportunity to try things he couldn’t have tried on a smaller system, plus the experience of brewing on both a large and small scale to be sustainable. When discussing his brewing process, he described his process very similarly to how he would work with a company to develop their branding, systematically, logically, and detailed. Shannon Brewing Plans on Canning, release is TBD. The brewery itself will be a hotspot of activity, with a Beer Garden and normal weekly tour times. When I asked what the Beer Garden was going to look like, Carter replied. “We actually just added another 1000 square feet to the beer garden and pulled the roof out more to shade it more from the Texas sun. I want to make this a place where people feel comfortable and want to come out and relax, no matter what the Texas weather decides it wants to do that day.” There are other plans by developers who wish to bring in shopping close by and possibly restaurants as well. This will make Shannon Brewing more than just an Saturday afternoon of fun, but an anytime destination for beer lovers and local Keller residents alike. Carter let us sample 5 of his beers, the All American Blonde, Irish Red, Pale Ale, Chocolate Stout and straight from the kettle, an un-carbonated IPA. Waiting for his equipment to be installed at the brewery, Shannon has been brewing at home with water brought from the spring and these beers show the beauty and delicious taste of a beer made with spring water. Much like you can taste the more mineral water in breweries that use well water or from a rocky area lake, the spring water really stands out consistently with each brew. I found the All American Blonde and Pale Ale especially refreshing and could see it being a great beer to drink on a hot day. His Chocolate Stout was dark and had some delicious dark chocolate and toffee notes, and his IPA had a interesting character where it wasn’t to hoppy but gave the right punch without sacrificing the taste, you want on a hop forward beer. The Irish Red was very tasty and Carter told us he wanted to make it as close to the original Irish style as possible, with more of a malty taste than hoppy that other American breweries tend to do. Carter smiles, “One of the things I’m looking forward to is playing with different ideas, using the spring water. Like making a proper Summer Shandy, available only at the brewery.” Shannon Brewing aims to have the brewery open later this year. They will be canning and bottling their beers and until they begin that process will stay local to the area around Keller. Carter tells us he does plan to expand past the Keller-Roanoke-Southlake area, but he wants to support the local community that supported him first and then introduce his beer to the rest of North Texas. We are excited to see him do this and can’t wait for you to try his beers. Sláinte!